Herman Miller® replacement chair springs for Ergon office chairs can restore new life to an old worn out office chair. Remove the four Allen -head machine screws that hold the seat of the chair to the rectangular steel base plate using a 1/4" Allen Wrench. This will expose the rubber-coated spring at the top of the base assembly. 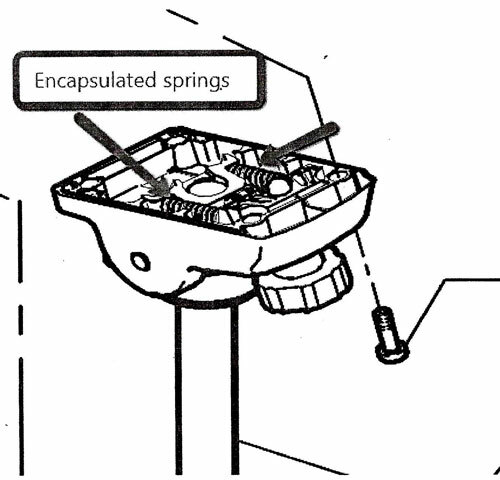 Observe how the rubber-coated spring is held in place by wedges with integral pins. Observe how the chair back-tension knob thread passes through the large dark metal wedge with silver wedges in front and back. The design is for tension on the knob to pull the dark wedge downward to compress the spring. Remove the Allen-head cap on the end of the tension knob screw using a 3/6" Allen wrench. Remove the dark metal wedge to make space to replace the old spring. Position the new spring with the silver wedges with pins at each end. Reinstall the dark metal wedges and the All-head cap that secures the back-tension knob. Check correct assembly by partially tightening the chair back tension knob to see that the wedges are drawn downward and new spring compresses. Lubrication of wedges with Wizard Formula 41 will provide smooth easy operation. Reinstall the seat of the chair making sure the back-tension knob is located towards the front of the seat. Enjoy your restored classic Herman Miller Ergon chair.